Why Can Dental Implants in West Monroe Fail? Dental implants in West Monroe have quickly become one of the most preferred and effective solutions to replace missing teeth. As a predictable and reliable option, more than 500,000 are placed each year due to their high level of success. On average, they are 95% effective for providing a long-term option to treat tooth loss. While it is rare, implant failure can occur. When dental implants fail, it is commonly due to infection or poor osseointegration. An infection known as peri-implantitis, which is a form of gum disease, is the leading reason for implant failure. It can be caused from the surgery itself or afterward due to bacteria entering the mouth, which is why oral hygiene is critical after their placement. The infection affects both the hard and soft tissues, as well as the surrounding bone. When caught early, it can sometimes be treated, allowing the dental implants to continue to be a viable solution. However, in most cases, they will need to be removed and replaced. With the risk for infection compromising the success of the procedure, it is important to maintain your dental hygiene, preventive care with your dentist, and to stop smoking. The success of dental implants relies on the jawbone fusing to the post, which takes several weeks to occur. However, in some cases, the two may not correctly fuse to one another. This can cause the post to become loose or fall out while you may also experience bone loss in the jaw. Failed osteointegration can be the result of several issues, such as decreased bone density, incorrect placement of the posts, or trauma. Nerve and Tissue Damage: If the implant is placed too close to the nerve or the soft tissue becomes damaged, it can cause significant pain and discomfort. Sinus Problems: When the upper teeth are replaced, insufficient bone density can lead to sinus issues. A sinus graft or lift may be needed to better support the implant post. 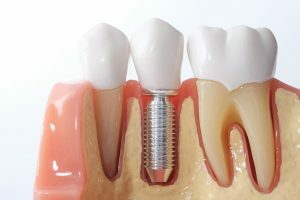 Overloading: When the abutment, crown, and implant post are placed at the same time, it can lead to overloading, which causes excessive force or pressure that can hurt the osseointegration process. Foreign Body Rejection: Titanium is used to make the implant posts biocompatible while also reducing the risk for allergic reaction. However, in some cases, the body may reject it due to considering it to be a foreign body. Although dental implant failure is rare, to reduce the risk, it is important to choose a dentist who is specially trained and qualified to handle your procedure. Dr. L. King Scott is specially trained in an array of dental procedures, including restorative, cosmetic, and implant dentistry. Due to his extensive qualifications, he offers the most advanced procedures, including dental implants. If you have any questions about the treatment, contact our office today to schedule a consultation with Dr. Scott.